If there is a book out there that has made me more eager for farmer's markets and for my own berry patches and rhubarb to be ready to harvest, I don't remember it. Put 'Em Up Fruit- A Preserving Guide & Cookbook. 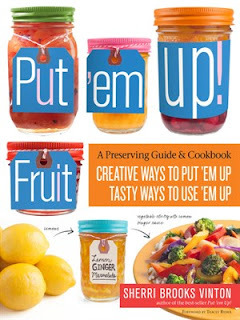 Creative Ways to Put 'em Up, Tasty Ways to Use 'em Up is by Sherri Brooks Vinton who also wrote Put 'Em Up. Enthusiastic, knowledgeable and creative, this collection of techniques and recipes for preservation and recipes for using what you've preserved will inspire anyone. It's presented in a great way that can be understood by absolute beginners to canning, dehydration, and other preserving methods. There are great photos throughout the book as inspiration, illustration and instruction. So what makes this book so great? The variety of fruits and methods is certainly one thing. She explains different methods for preserving everything from every day apples to things like quince. Berries, rhubarb, pears, citrus and my favorite stone fruits are all included. The methods covered create jellies, jams, sauces, gastriques, infusions,homemade vinegar, cordials, fruit leathers and compotes. The recipes for using up your preserves are also a great reason to enjoy this book. You'd expect a lot of desserts, and you'd be right of course. Fruit lends itself well to desserts, but there are also a lot of savory recipes. Not just for cooking with your preserves, but also one for blueberry ketchup my daughter wants to make after we go blueberry picking later this year. There are main courses and side dishes included in the recipes. The recipes are good for entertaining and family dinners, mostly simple enough to make with great flavor and texture combinations. The information is fantastic, the author explains the methods step by step in a clear and concise way. She also includes cutting instructions so people can learn the basic knife skills to really make things beautiful. The instructions include great, full color photographs for visual learners. The book starts with a table of contents of course, but at the end also includes a resources guide and a very complete index. Absolutely recommended to anyone interested in food preservation and canning. This is one that will be used extensively throughout summer as more things ripen and become available in both my garden and at local farmer's markets. You can watch videos by the author right here- Put 'Em Up! Fruit - You will learn how to make a blackberry gastrique, how to can using the water bath method and a recipe for using the gastrique with downloadable PDFs of the recipes shown. The author is also going on tour to promote her book and you can catch her all over the country at farmer's markets and book stores. Check out the schedule HERE.